By far the best waterbird habitat in Monterey County is the Moss Landing/Elkhorn Slough vicinity; indeed, this tidal slough and adjacent freshwater ponds combine for some of the best birding in all of North America. It has been recognized as an Important Bird Area (IBA) of international significance. Along with the much larger San Francisco & Humboldt bays farther north, it is a principal staging and feeding area for migratory shorebirds. Elkhorn Slough is located right in the center of the curve of Monterey Bay (map right) and drains directly into the Pacific Ocean through the Moss Landing harbor channel. Before the channel was created (1946) and the rivers diverted (1908-1910), the Salinas River ran north from its present mouth to its old original mouth north of today's Moss Landing. Today's Moss Landing harbor and various sloughs to the south are part of this old river bed. 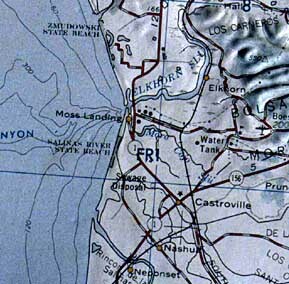 The Monterey Bay Aquarium has published a fine introductory guide to Elkhorn Slough by Mark Silberstein and Eileen Campell (1989); in addition, the Elkhorn Slough Foundation has extensive information on-line (and a detailed map). I can offer only a few highlights here directed to the field birder (more details were published in Roberson 1985). Moss Landing harbor is easily accessible to all, but public access to the Slough is limited to a few points -- primarily Elkhorn Slough Estuarine Research Reserve and Kirby Park in the upper reaches of the slough. Another great way to bird the area is from the Elkhorn Slough Safari pontoon boat rides; the trips leave from the Moss Landing marina (extreme lower right in photo below). Mark Silberstein's wonderful aerial photo shows essentially all of Elkhorn Slough and Moss Landing harbor. Locate principal sites, especially those of birding interest, on the legend (left) and then find them on Mark's overview photo (below). This view is looking east from Monterey Bay. Highway runs through the center of the photo; to the north (out the upper left side of the photo) this road goes to Santa Cruz, and to the south (lower right side) it heads toward Monterey. Highway 1 crosses Elkhorn Slough at the lower right center of the shot; the huge power plant (built by PG&E, now run by Duke Power) is just south (right) of that prominent bridge. Moss Landing Wildlife Area and the Moss Landing harbor -- the old salt ponds on the inland (east) side of Highway 1, just north of Elkhorn Slough, are now a State Wildlife Area(W.A.). The ponds are controlled by tidal gates; those near the Slough are great for shorebirds and a major roost of Brown Pelicans. There is also a Harbor Seal pupping area. The more northerly ponds are mostly kept dry from an important breeding colony of endangered Snowy Plovers. Access used to be through trails beginning at the northeast corner of the W.A. but currently that access point and the trails are closed. Access is now available through a gate portal (right) that includes explanatory signs about the area, and that leads to a trail along Elkhorn Slough itself for a short distance. A scope is often needed here to view the dry ponds (on which terns roost in fall), the pelican roost area, and the many happenings in the Slough (sea otters and sea ducks are common). This access area is reached from Highway 1 just north of the bridge over Elkhorn Slough through a short dirt road that is sign-posted (labeled "access" in the photo legend above). The access to Moss Landing W.A. 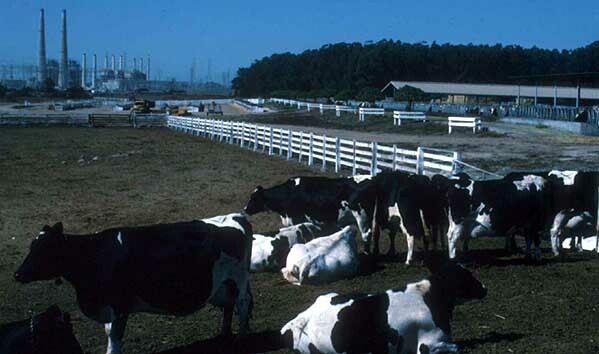 is thus east (inland) of Highway 1, but just opposite -- to the west -- is the Moss Landing harbor and vicinity. 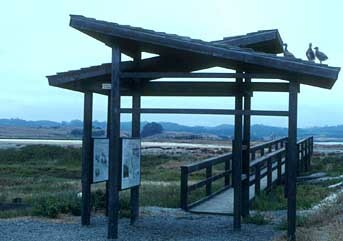 There is public access just north of the bridge over Elkhorn Slough to a large parking area for restaurants [the most famous to birders was "Skipper's Restaurant" but it burned down 25 Ap 1998 and at the date of this writing in Sept 2000 had still not been rebuilt]. From this parking area and the nearby boat ramp to the north one has views of Moss Landing harbor. Sea ducks, loons, grebes and gulls are the specialties here, and in winter all 3 scoters may be present (Black is rare) plus an occasional Long-tailed Duck, Red-necked Grebe, or something even better (Emperor Goose in 1978). Jetty Road and Moss Landing State Beach -- this turn-off about a half-mile north of the Highway 1 bridge over the Elkhorn Slough is well marked. Almost immediately one has tidal mud flats to the left and right of the road, but the only legal parking is down to the right near the kiosk that goes to the State Beach. This is a very fine area for migrant shorebirds and terns; Red Knots are regular spring & fall, and a few winter. Things change rapidly as the tide moves in and out (at high tide all flats can be covered; in the photo below the tide is getting high and the mudflats south of Jetty Road have become an isolated island). There is a fee to drive into the State Park but the views from the parking areas beyond the kiosk back into the harbor can be superb. 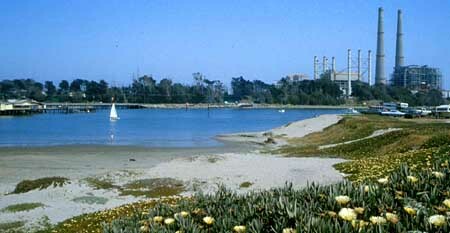 The shot (right) shows the harbor, the dominating Moss Landing power plant, and the final parking area at the base of the north jetty. About half-way to the end there is a standard gull roost at harbor's edge and views from the State Park are best in the afternoon. Many rare species have visited this roost, including Swallow-tailed, Glaucous, Iceland, Franklin's and Laughing gull. At road's end there is a parking area and one can walk to the jetty on the north side of the harbor. The entire State Beach itself is full of birds -- gulls, terns diving offshore in season, shorebirds, flocks of Snowy Plover in season, and rarities such as Wilson's & Mongolian Plover have been with these flocks. Huge swirling flocks of Sooty Shearwaters can be just offshore in spring through fall. Moss Landing "island" and the South Jetty -- the town of Moss Landing is accessed off Highway 1 just south of the power plant and the bridge over Elkhorn Slough. A loop road goes through the tiny town (which is famous for antique stores) and connects back up with Highway 1 a short distance farther south (Moss Landing Marine Lab and a cemetery are along the south end of this loop). In the middle of town the only cross-street (Sandholt) heads past the Moss Landing marina (where one begins the Elkhorn Slough safari boat trip) and over a one-way bridge to Moss Landing "island" (actually a thin peninsula that ends at the south jetty to Moss Landing harbor). There is a parking lot for the state beach at the north end of the one-way bridge, and this lot, plus both ends of the bridge, given good views to other tidal areas of south Moss Landing harbor. [In fact, in crossing the one-way bridge you are crossing the old Salinas River channel.] When tides and seasons are right, this area is great from shorebirds, grebes, ducks, and Brant. The paved road meanders through various ship-docking areas and shops and dead-ends at the South Jetty. Park here and walk the very short distance to the base of the jetty; bring a scope. Four species of loons (three regular, Yellow-billed very rare) have been found here, all the sea-ducks (including the very rare King Eider), all the grebes, and there is always a chance for alcids. Common Murres are often just outside the jetties year-round as are Pigeon Guillemots in late summer. Rarer species have also been seen. Parasitic Jaegers often chase Elegant Terns at the harbor mouth in fall. Potrero Road -- at the south end of Moss Landing town, Potrero Road heads west and ends at another access point for the State Beach. Right at the end the road crosses the old Salinas River channel again; this is another good shorebird area in season. The artichoke fields to the south are hunted by a wide selection of raptors in winter; these fields can also be viewed along Molera Road which loops through them and back to Highway south of Castroville. Dolan Road -- Dolan Rd. goes inland from Hwy 1 at the Moss Landing power plant. Elkhorn Road intersects it about 3 miles inland; one follows Elkhorn Road north (left) to reach Elkhorn Slough Estuarine Research Reserve and the upper end of Elkhorn Slough. Just before (west) of Elkhorn Road, Castroville Blvd. goes south (right) and connects with Highway 156 near Castroville. Dolan Road and Castroville Blvd. both have views of Moro Cojo Slough (south of Dolan Road; Castroville Blvd. crosses the upper end of Moro Cojo Slough). Scopes are needed but the slough often has a wide variety of ducks and shorebirds. Dolan Road passes through cattle-grazing land, and sometimes Cattle Egrets are with cows in fall/winter. The swirling blackbird flocks usually have Tricoloreds and the occasional Yellow-headed Blackbird in May and again in fall. MoonGlow Dairy -- for avid birders there may be no better spot in the entire area than the privately owned MoonGlow Dairy (photo above). It has fabulous views of Elkhorn Slough (a scope needed), a freshwater pond next to the Slough, and the State's best eucalyptus grove. It is located 1.2 miles east of Highway 1 off Dolan Road. I was first able to arrange birding access here about 20 years ago, and the owners -- Louis & Carol Calcagno -- have welcomed birders ever since. However, this is an active dairy operation and there are important rules you must know before birding here. CLICK HERE FOR A SEPARATE PAGE ON BIRDING AT MOONGLOW DAIRY; the page also highlights some of the rarities which have occurred. It is the active operation of the dairy that attracts huge flocks of blackbirds (Tricoloreds in huge numbers except in spring when they return to breeding colonies), and it is the dairy's active management of the freshwater pond that creates duck habitat in winter/spring and shorebird habitat in fall. The pond (below) is the single best freshwater pond in Monterey County and it would not exist except for the dairy. It is one of the most important resources on the Slough. Please remember to be on your best behavior here, to park well away from dairy operations, and to drive slowly on the dirt roads. I (Don Roberson) feel a special responsibility here since none of us would have access but for the groundwork laid two decades ago. Elkhorn Slough Estuarine Research Reserve -- Elkhorn Slough E.R.R. is open to the public daily 9 a.m.-5 p.m.Wednesday through Sunday (there is an entrance fee). It is located about 3 miles north of Dolan Road on Elkhorn Road (there are signs). The Reserve protects an amazing variety of habitats, including tidal mudflat, tidal sloughs, a few freshwater ponds, coastal grasslands, and live oak woodlands. There is a very fine visitor's center and many miles of peaceful trails; obtain a map and information at the visitor's center. Some very important breeding colonies occur here for Caspian Terns (on an island in the tidal sloughs) and for Great Blue Herons, Great Egrets, and Double-crested Cormorants (in an old eucalyptus grove next to a small freshwater pond). The grasslands host White-tailed Kites and Red-shouldered Hawks, and the oak woodlands have Oak Titmice, Chestnut-backed Chickadees, Nuttall's Woodpeckers, and Hutton's Vireos. Indeed, it was the wide variety of habitats within a short distance that enabled a local team to set what was then an all-time "Big Sit" record here (117 species on 31 Oct 1982 from a flatbed truck sitting on the hill overlooking the "Five Fingers" area; there is a nice bench here now). The entire wetland area are prime hunting grounds for Peregrine Falcons, Ospreys, and Merlins (in fall/winter). Kirby Park and Elkhorn Road -- north of Elkhorn Slough E.R.R., Elkhorn Road follows the edge of wetlands and is therefore lined with birds. A small wetland at the intersection of Strawberry Road is a traditional site for the few Lesser Yellowlegs that winter locally; look also for flocks of wigeon (in winter; search them for the occasional Eurasian) and phalaropes (in spring & fall). There is an overlook pullout about a mile north of here to view marshland with lots of egrets and ducks, and then comes the access road to Kirby Park. There is a lot of parking adjacent to the Slough and a boat ramp. A boardwalk meanders north along the Slough. Lots of rarities here over the years including White-faced Ibis, Tufted Duck, and even Long-eared Owl (in the first willow patch right of the boardwalk). When the tide is high, Common and Red-throated Loons can be upslough to this point. There once was a small population of Clapper Rail in the pickleweed here, but all were lots to non-native Red Foxes by the 1980s. Farther north, Elkhorn Slough crosses the upper end of Elkhorn Slough where you can scope both directions. Ducks and a few geese in winter; terns and shorebirds in summer & fall. Elkhorn Slough itself is accessed by boat. I recommend Elkhorn Slough Safari pontoon boat trips which are led by naturalists. You can also join kayak trips up the Slough and around Moss Landing harbor. Out-of-towners may obtain private tours from Elkhorn Slough area resident Rick Fournier at Monterey Birding Adventures (for a fee). I thank Rita Carratello, Steve Bailey, Todd Newberry, Mark Silberstein, Steve Rovell, and Roger Wolfe for comments on an earlier version of this page. Roberson, D. 1985. Monterey Birds. Monterey Pen. Audubon Soc., Carmel, CA. Silberstein, M., and E. Campbell. 1989. Elkhorn Slough. Monterey Bay Aquarium, Monterey.